Mario Weigand has a magical telescope that captures images with excellent tones and high resolution. But when he sends them to me I always try to pull more out of the shadows - and there is always more to see. This huge and excellent image includes too many treats to describe but a couple of details are especially revealing. First, ejecta from Triesnecker, near lower left, is clearly seen covering a rille segment south of/below the crater. This shows that Triesnecker is younger than the rilles, which is somewhat surprising because the lava and rilles to the east/right of the crater are not covered by ejecta. Shifting to the the western side of the Hyginus Rille, at least 7 of the rimless collapse craters that make the rille are visible. These collapses are similar to pit craters in Hawaii that align above underground conduits that conduct magma away from Kilauea crater, the role played by the crater Hyginus on the Moon. Hyginus is probably the largest volcanic crater on the Moon - why aren't there other big ones? 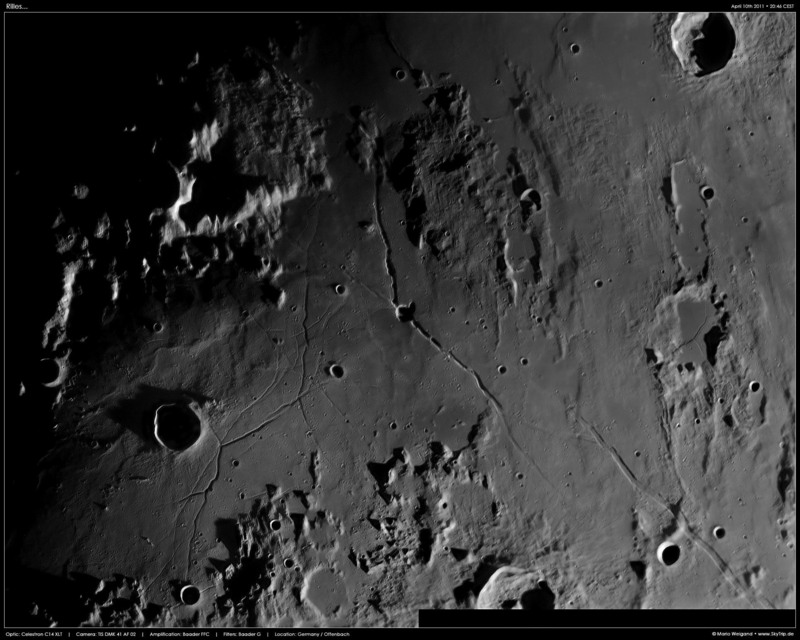 Finally, near the west end of the Ariadaeus Rille is one of the rare examples of a lunar strike-slip fault. Notice that the rille has an abrupt horizontal offset. For most lunar faults the crust moves down (e.g., the Straight Wall).